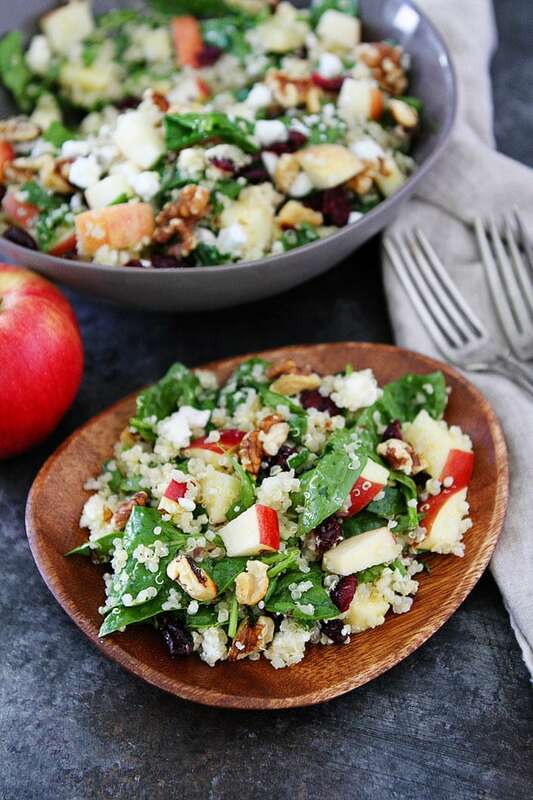 Apple Walnut Quinoa Salad with spinach, dried cranberries, goat cheese, and a simple maple mustard dressing is the perfect salad for fall. It goes great with any meal. I have been baking up all of my favorite fall recipes…pumpkin cinnamon cookies, apple slab pie, pumpkin cream cheese muffins, and salted caramel apple crumb bars. Our kitchen has been smelling so good and I have been enjoying every bite, but my jeans have been feeling a little tight…ha! I decided it was time to take a break from fall baking and make a healthy fall salad. 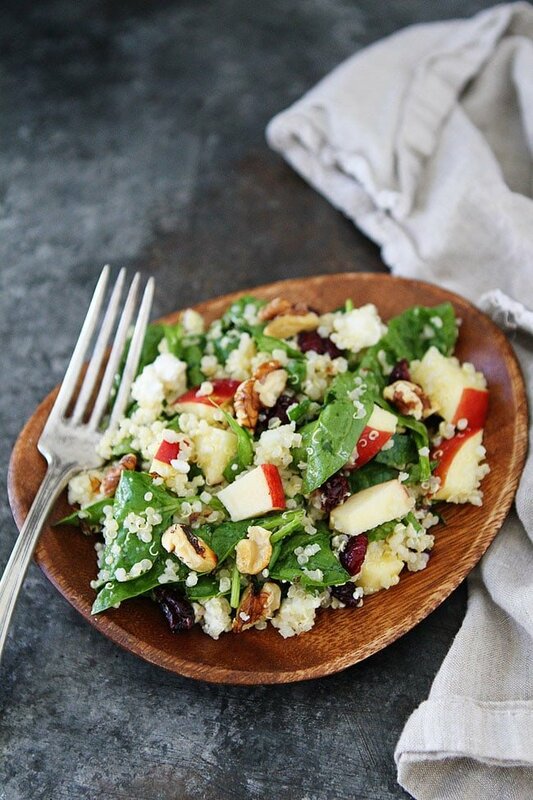 I am all about balance:) I made this easy Apple Walnut Quinoa Salad and it is fall perfection! I eat apples every single day, no matter what time of year it is, but I usually eat more than one apple a day during the fall because they are SO good. I HAD to put them in this salad because I can’t get enough. I love apple season. The quinoa salad is finished with a maple mustard dressing that pulls all of the fall flavors together. Don’t skip the dressing, I promise it is easy to make. You can whisk it up in just a few minutes. This loaded salad is filling enough to be a meal, I love eating it for lunch, or it can be served as a side dish to any meal. 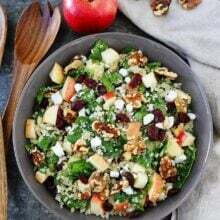 You will love all of the textures and flavors… protein-packed quinoa, leafy green spinach, crisp apples, sweet dried cranberries, crunchy walnuts, creamy goat cheese, and that amazing maple mustard dressing. 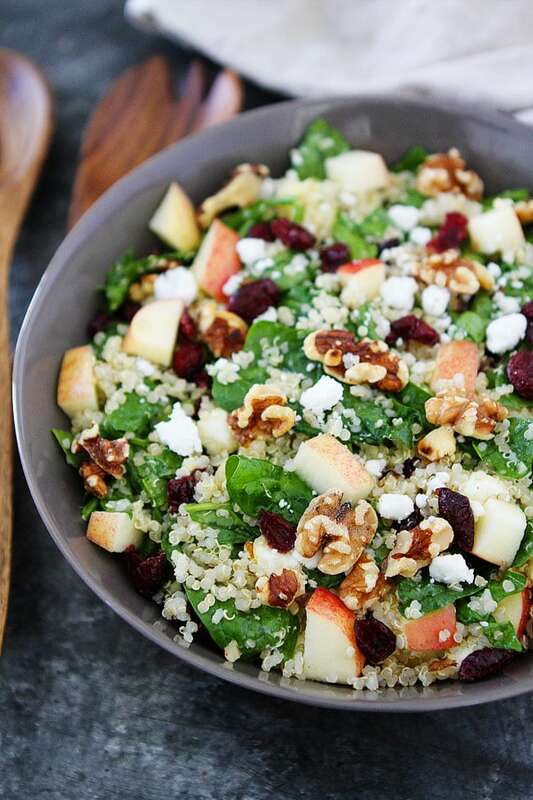 This easy Apple Walnut Quinoa Salad would make a great side dish to your Thanksgiving meal too. I know it will be making an appearance at our holiday meal, but I can’t wait that long to enjoy it again so it will be lunch today! I love this salad and I hope you do too! This is the perfect salad for fall! 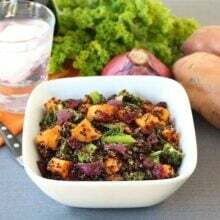 Enjoy it for lunch, dinner, or serve it as a side dish for Thanksgiving. First, make the maple mustard dressing. In a small bowl or jar, whisk together the olive oil, lemon juice, apple cider vinegar, maple syrup, mustard, garlic, salt, and pepper. Set aside. 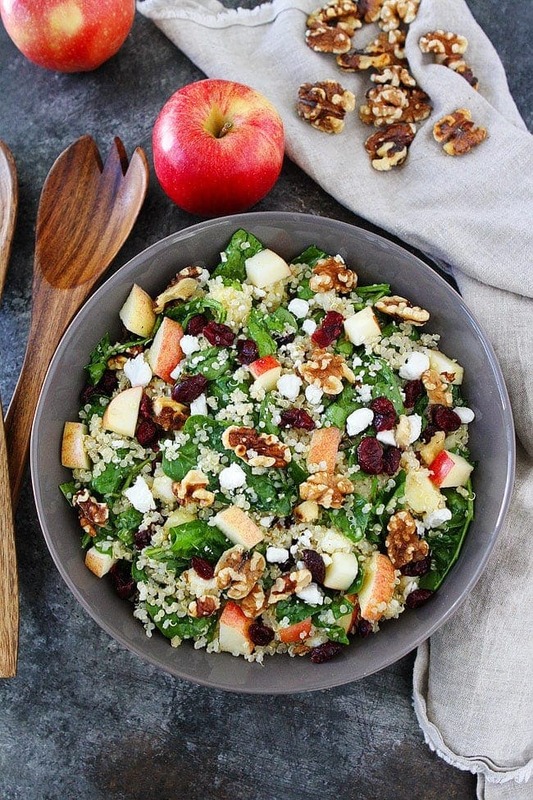 In a large bowl, add the spinach, cooked quinoa, apples, dried cranberries, goat cheese, and walnuts. Toss until salad is combined. Season with salt and black pepper, to taste. Drizzle with dressing and toss again. Serve. This is my kind of salad! I could eat it every day! Do you have macros for your recipes? I made this last night for dinner and it was fantastic!! Great fall recipe that isn’t a soup, it’s been super hot and humid this week! The dressing was great too, I added a little more mustard and apple cider vinegar for some extra punch. Great combination of flavors! It’s healthy, easy to make. thanks so much! these are all my favs! perfect for a Fall lunch! First quinoa usage ever. Just made it–absolutely delicious–definitely a keeper! Glad you enjoyed your first experience with quinoa! 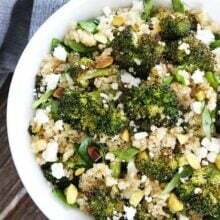 We have a lot of other quinoa recipes on our site too! SUPER FRESH LOOKING AND SOUNDS AMAZING! 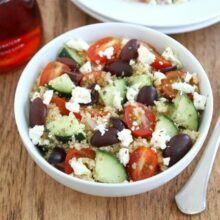 I love salads with quinoa, such a special flavor! I’m thinking of adding just a wee bit of sliced onion…think it’d give a nice touch (since I love onion). Another amazing salad from you! Brought it to a team lunch and everyone loved it! How do you think feta would do instead of goat cheese? Feta is great too! Enjoy! Made this salad tonight,it’s so good can’t stop eating .I’ve been making yours salad and I’m never disappointed. If you want it to last longer you can always wait to add the dressing until you are ready to serve it. You can toss the dressing in right before serving. I enjoy the leftovers the next day and the salad is still good, but if you are serving it to guests, I would wait to toss right before. This is so great! I served it at our potluck Christmas and everybody loved it. The best grain salad ever! I’ve subbed farro for quinoa for a bit heartier salad; I’ve also used different greens. The combo of ingredients and the dressing makes this fabulous! Could like to know the calories? In one word: Phenomenal! The combination of savoury and sweet flavours is superb! 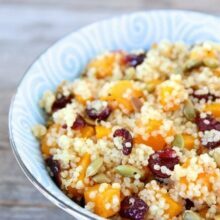 This will be my go-to quinoa salad recipe!